On Sunday 28 August our VCE students enjoyed a day dedicated to the “Rembetika” songs - “Greek Blues”- a curriculum theme undertaken by all VCE students studying at our Greek Language & Cultural schools. The program comprised of two parts; during the course of the morning the students practised their oral skills under simulated exam conditions hence providing them with the opportunity to discuss, present and develop their knowledge with regard to their detailed study topic. 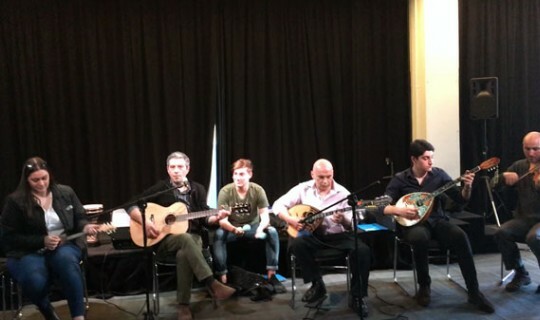 In continuation, students had the unique opportunity to enjoy an afternoon of live “Rembetiki” music presented by Archie Argyropoulos & Taki Demetriou. Both performers discussed with the VCE students the intricacies of the “Rembetika” genre for over three (3) hours and presented a selection of songs that mesmerised the audience. The discovery of new talent was one of the highlights of the seminar session, with both Niko and Ms Androniki proving their vocal talent, Chysoula with her “baglama” performance, Dimitri playing the maracas and Charalambo, the talented bouzouki player. Our sincere congratulations to both the organisers and participants of the seminar program. Such initiatives prove that the intertwining of education and practical engagement can be both entertaining and beneficial in the attainment of knowledge.